Having been a member of this Forum for years, I thought it long overdue to write a short note of thanks to Brian and all of those other members who freely contribute by sharing their knowledge and experience with others. The study and appreciation of Japanese arms and armour is a complex subject, the study of which is complicated by a labyrinthine terminology, and to most of us, a complex foreign language. 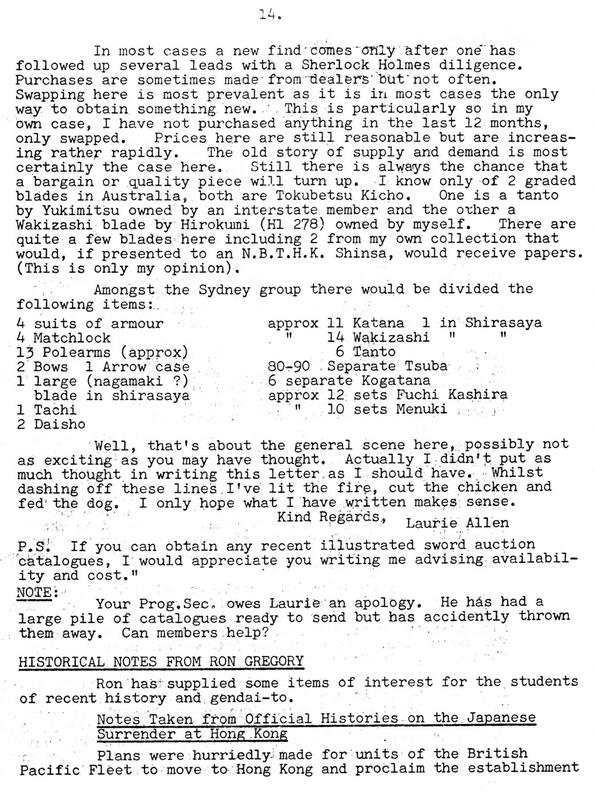 I well remember my early days of collecting when the only source of information available to me was Basil Robinson's 'Primer of Japanese Sword Blades' and how I struggled to understand something of what was being described in its pages. Forums like this have opened the door for so many on a wonderful world of study and interest. THANK YOU BRIAN AND ALL WHO HAVE CONTRIBUTED YOUR HARD WON EXPERIENCE. Just wanted to share a post on the delivery of a new Gassan Sadatoshi (November 2018 reg) and say a big thank you to Paul Martin for helping to make this a reality. The sword is beautiful and I am completely ecstatic! Paul Martin was, as always, great to work with in order to make this happen. #166627 What's All This Then? Welcome to the newest incarnation of the Nihonto Message Board. It all looks confusing, but trust me you will be fine. Most of it is fairly logical and easy to navigate, so don't stress. I have taken this opportunity to explain a few things though, and to make the transition as simple as possible. This software has some huge improvements over the last one, and there are a ton of things that we will get the benefit of over the coming months. Already there are alot of nice features, but this is just scratching the surface. Posting is fairly easy, as is navigating. You might find it a little slower. Please bear with us, as we are going to have to upgrade hosting to gain some resources. Calendar - There is a nice new community calendar. You can check all the upcoming events there. You can also add events, but they will need to be moderated before showing. This will be of great use, and I encourage everyone to add events or let us know what to add. All your old links are still there, nicely formatted along the top. Research leads to the main ones. FAQ is a work in progress, that we will add to as we publish more articles. Adding attachments is now even easier. When posting, you will see how to do it. There are 2 systems of uploading. See which suits you. As before, upload the attachments, and only then submit the post. We now have nice thumbnails that can be clicked on to size the photos, making for larger size limits. When reading a post, you will now find a quick reply box at the end of the thread. Much easier when replying. While doing that, if you should need to attach something, you need to click the box marked MORE REPLY OPTIONS. This will open a more advanced posting box, where you can upload your attachments. Go to your profile. You will find a ton of features there, including adding friends, changing ignore settings, viewing your attachments and other settings. You can update your status too. Please note, there are a ton of preferences that are worth setting there. Please click on your name, and go to settings, then notification options. All posts now have a "like" feature and the number of posts that have been liked appears in your profile. There is a new and strict automated warning system. This is something much needed, and will take away some of the personal feelings involved in penalties. Different offenses have points allocated to them. Mostly one point, for things like spamming, excessive self-promotion, rudeness, abusive behavior and others. These warnings are given by mods and admin, and once you have a few points, there are automatic penalties. 2 Points and you cannot post for an hour. 3 Points and you cannot post for a day. More points lead to suspension of accounts for a week, a month, or permanently. Of course points also expire...so better behavior gets you back to zero points again. They usually expire in 30 days. This system will be modified as we go along, but it will be enforced. Where is the "preview topic" or "go to last post"? Don't worry. They are still there, only in a different format. When you go into a section like General Nihonto Discussion, look just to the left of the number of replies/views. There is a little arrow there. Click on it for a preview of the first and last post. You can also click first or last and go to that post. Fancy! TAGS - these are nifty little tags that you can add when you post, that will allow you to find more topics with the same subject later on. There is a set list of tags you can use. I can add more if needed. So if your post is about restoring a wakizashi...then you can add the tages "wakizashi" and "restoration" and it will immediately give an idea of what the topic is about, and you can search for similar topics. I am going to enforce using the eBay tag for posts about eBay. Adding media is now much easier. Just paste a picture or Youtube link or whatever, and it does all the hard work for you! Ok...so all the topics are now showing as unread from the last forum. No problem. Just go to the bottom of the forum, and click on "mark Community Read"and then choose all posts, or everything on the forum. While there, click on "Help" to get better advice than I can remember to type here. Hover over someone's name to get a popup profile for them. You can send them a pm directly from there. On the topic of PM's. The messenger is now far better in that it is "conversation based" and not just a bunch of individual messages. This allows you to follow a conversation. And even better, you can add other people into the pm conversation. Just check the options to the left when in messenger. You can store about 150 messages before you need to start clearing some out. Remember to delete old ones if not needed. CHAT. Yes..we now have a live chat, allowing up to 25 people. Only way to explain it is to say try it out. Middle click CHAT to open in a new window full screen. Then chat away. I don't have to warn anyone about behavior there do I? The usual rules apply. You can tell how many people are in the chat from the main forum page. Bit slow for now..we will work on that. Can be a very handy feature. Bottom left of the forum, you can change themes. I find the default to be the best, but will add others for those who want a different style/color theme. Also, this forum has a great look when browsed by cellphone. Those using cell more and more should find this far superior. More to be added as I go along. Enjoy, and use the Test forum for that purpose or to chat about the new look. New members joining and immediately sending offers of swords to people via pm. Do NOT fall for it folks. Please let me know if you get any suspicious offers from unverified members. Ask them to prove their location or give you known Nihonto community members who can vouch for them. And DON'T trust email addresses that seem to be known. They can have an extra digit or something making them seem like a known email. Today we have someone new with the above activity. I am looking into it. IP address seems to go back to Nigeria, so not looking good. But please always be aware. Well I've been planning to let some steam out regarding this for a while now. I have seen a notion on recent years where collectors are starting to "go against" shinsa results (regardless of the organisation) and it often happens when the attribution is not favorable or what one thought it would be. I've actually thought of making a small ranting topic on defending the shinsa for a while but never got around to it until now. You often hear the common phrase shinsa panels are just human and people make mistakes but they are still experts whose opinion at least I hold at high value. Those experts have the ability to see minor details in the blade (or fittings) that regular collectors miss. I was reading Kantei explanation by Hinohara Dai of May issue of Token Bijutsu where he went bit off from kantei sword to ramble a bit how some experienced collector noticed the very minor detail in curvature of near identical swords from Kamakura and early Muromachi on display and that raised many questions from other collectors there at present. This comes down to what he explains that professional appraisers and sword dealers handle many blades on a daily basis. I could personally add to this group even active collectors in Japan as there are so many opportunities for that in Japan. I think all that he wrote applies to tsuba and other stuff as well. The experts see and handle so great number of items that average collector do not come even close to that. Yes we have some great opportunities even in Europe and US but we cannot compete with Japan. 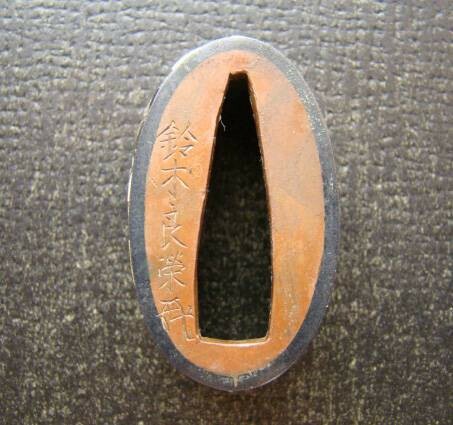 But then there are those cases where it is not clear at first glance if it is a Kamakura or an early Muromachi tachi. In such a case, one sometimes hears comments like “how can an expert not recognize at least the period immediately?” That is, an expert should at least know right away if he is handling a Kamakura or a Muromachi blade. Well, from my own experience and handling somewhere between 100,000 and 200,000 blades, I can confirm that these cases exist and that they are not rare at all. But here it is recommended to bo back from examining the jiba to the sugata, the first traditional kantei point, and after studying the shape again more closely, eventually return to the jigane and the hamon. Often, the initial gut feel was right but that feel should either be substantiated or dismissed to arrive at a well-founded opinion. That above is a direct quote from that write up by Hinohara Dai. Even though he writes about kantei of swords I think we can apply it to tsuba and other stuff too. When someone has handled and studied like 100,000+ items I wouldn't easily challenge his/hers opinion about this stuff. The shinsa teams are professional experts for a reason and they have so much experience to back it up. I've just heard lately people from many medias stating that NBTHK made wrong call or NTHK do not know what they see etc. Perhaps it is the collector who might not see everything? I remember a bit funny thing from some years back when I took my tachi to NBTHK Scandinavian meeting, after seeing the sword Jan-Erik Svanberg told me few details of a sword I had had for multiple years that I had missed before. That was the first time I personally experienced how quickly experienced collectors can notice minor details and I was bit mindblown. Another great experience was at Utrecht 1 minute kantei session this summer. While I was at the right tracks I was amazed how much details experienced people picked up in just one minute. So to sum it up if you think experts have got it wrong be sure to have lots and lots of research to back your own opinion and try to understand the expert opinion too. And if you think you can outsmart Japanese dealers it's a good idea to think twice as their knowledge level is very high and they handle and study very large amount of swords. I've been working as an armour restorer since the early 1980's and committing to a full-time venture since 2011. During that time I have been professionally trained in the art of urushi by Kitagawa sensei of the Kyoto Prefectural University. However, the art of armour has been a self-taught process where I have deconstructed armours over the years in order to replicate the process. My business is good, I have a number of years of pre-bookings ahead and a proven track record by my client base. But I have never studied being a Katchushi in Japan. This year I took it upon myself to throw myself into the deep end. I begged and ask favours from my friends to gain an audience with today's leading Katchushi masters. Scheduled around this years DTI I was able to visit each Katchushi on my list. There is a little bit of rivalry between the masters, however, I managed to steer free of any politics. My plan was a simple one, I had prepared a portfolio of my work to present and then take the critic onboard. My first meeting was with Ogawa Sensei. 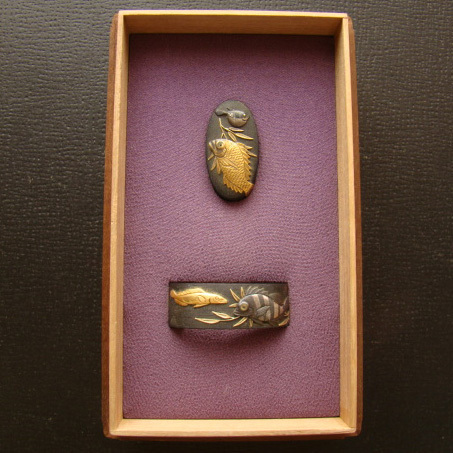 Ogawa had just overcome a serious health problem that now prevents him from using traditional urushi. Ogawa looks like a true samurai, his hair tied into a bun with a beard and traditional Japanese shokunin clothing. 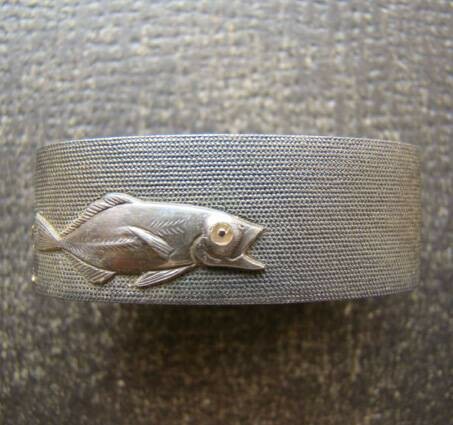 Despite not being able to work with urushi his metal work was the best I'd seen during my entire visit. He crafts complete suits of armour and recently completed a copy of a famous KATO dou for a local museum. Ogawa introduced me to his workshop and showed me his tools and formers for creating armour. Chris Glenn was also in attendance and is the deshi of Ogawa, he has been a student for over 15 years. Ogawa gave me some fantastic tips and showed me a technique that only 3 people know in Japan. My next meeting was with Toyoda Sensei. Toyoda subject is old armours, I must say that I was totally overwhelmed with this mans knowledge. He studies ancient texts in classical Japanese, he is the go-to guy for any archaeological finds. Toyoda is a very valued and skilled katchushi, I think I would be right in saying that he is one of a kind. I was invited to his workshop where he showed me three O-yoroi that he had been working on for 28 years. He has handcrafted the entire armours as 1:1 replicas of the originals. His commitment to detail and tradition is unparalleled as he even weaves the odoshi on his fingers. I spent many hours with Toyoda Sensei, we talked about the manufacture and reproduction of traditionally printed egawa and how the templates were made together with how rawhide is used in armour construction. The information received was most valued. After Toyoda I visited Nishioka Sensei who in the west is certainly the most well known. Nishioka runs the most commercial workshop with four full-time deshi working away on clients armours. I didn't have much time with him as he is extremely busy, however, he did take time out to tell me the secrets to making kirisuke from kokuso, dyeing techniques and he spent one-hour one-on-one correcting a lacing technique that has eluded me for years. My final visit was to Katchushi Andy Mancabelli. Andy has been the deshi of Miura Sensei, who is a true master of masters. I visited Andys new workshop where we talked shop and examined armour all day. Andy has a splendid workshop and store, it's really impressive. We actually had some differnces a few years ago, but we overcame them and I'm happy to now call him a friend. Well, the outcome. Being self-taught. I'm happy to say that nothing negative came from this. In some cases I witnessed complete amazement, in others, I was told that my restoration standard is equal to that in Japan. I can confidently say that I will stand my restorations against anyone outside of Japan. The Katchushi were amazing, they have extended a friendship and warmth that has really touched my heart. Introducing me to their workshops, sharing trade secrets, offering continual guidance has frankly exceeded my expectations. I owe these people complete gratitude and remain humbled by their kindness and honesty. I have been invited to return and study armour making in more detail spending a few months each year in Japan. My restorations are pretty much at the standard they need to be, but in order to be a real katchushi, I need to be able to make complete suits of armour. That now is where my focus is, I really can't wait to get back there and hammer metal. Sit in the favourite chair of the late katchushi Myochin Muneyuki at a local Sushi Cafe. Finally, at the DTI I met with a lot of dealers. I learned a new word "Sugoi" or wow, super! They were very pleased and surprised with my standard and speed. I have now been appointed the preferred restorer for two of Japans leading armour sellers. So a dream come true Ive met the masters and can return and further my study, I had my standard validated by the most qualified katchushi on the planet and bagged a restoration contract with Japanese dealers. #180797 What Is Happening To Nihonto Message Board? If I had to censor a word here, it would be "elitist"
Lots of people have left various online forums and activities due to being labelled elitist. No such thing here. Doing things the proper way, having the required respect, and not compromising the way things are supposed to be done is not elitist. It is just what some are prepared to do, to maintain the high levels this subject requires. I'm not going to go into that further, it has been covered in depth. Many of the long (longest) time members here don't have big collection, major works in their collections, or sometimes barely enough to cover monthly expenses. I could name them, but they know who they are (myself included) but still stick around giving advice and showing the proper way to do things. I suppose the elitists are the ones who, I have been told, regard forums as beneath them, and online study as a waste of time. They find the effort of educating others to be too taxing and the fact that people don't bow down before them to be disturbing. We don't have them here. Some have made brief appearances and then found it too much effort. Others want things their way or no way. The fact is that people come and go. Some take 1 month and some take 10 years. Show me an online forum with most of the founding members 10 years later? Peter, NMB doesn't need to be saved. As long as there are those with some knowledge to pass on, who are prepared to stick around and persevere, it will save itself. It is frustrating, I know. Beginners pop in, last a few months, and then move on. But a few stick around. Some of them will still be here in 5 years as dedicated collectors. It is hard...trust me I know. But to ask if this can be saved just requires me to ask one question: "I don't know....are you prepared to help save it?" Tanobe sensei confirmed it as authentic. Interesting kantei point, he said the lack of shinogi on this kind of old nakago helps confirm the age. That the early Kamakura and Heian nakago lack shinogi. He said the mei was better than some of the examples that the NBTHK has had in the past. There is an equal one that is Juyo Bijutsuhin but the blade is suriage, though it is also kijimomo and you can still see that in it (that one belonged to the Shimazu daimyo). There are only 5 other examples extant and published, one suriage in Juyo 13 (two character signature right at the bottom), one in Juyo 57 (two character signature but the tada is eroded away and it is attributed as DEN Ko-Ichimonji Munetada in spite of there being the one character visible, when you get DEN in combination with a signed blade it registers as very cautious). This one with the weak mei passed Tokubetsu Juyo which repeated the DEN Munetada and it's also suriage. That's it for the NBTHK blades. 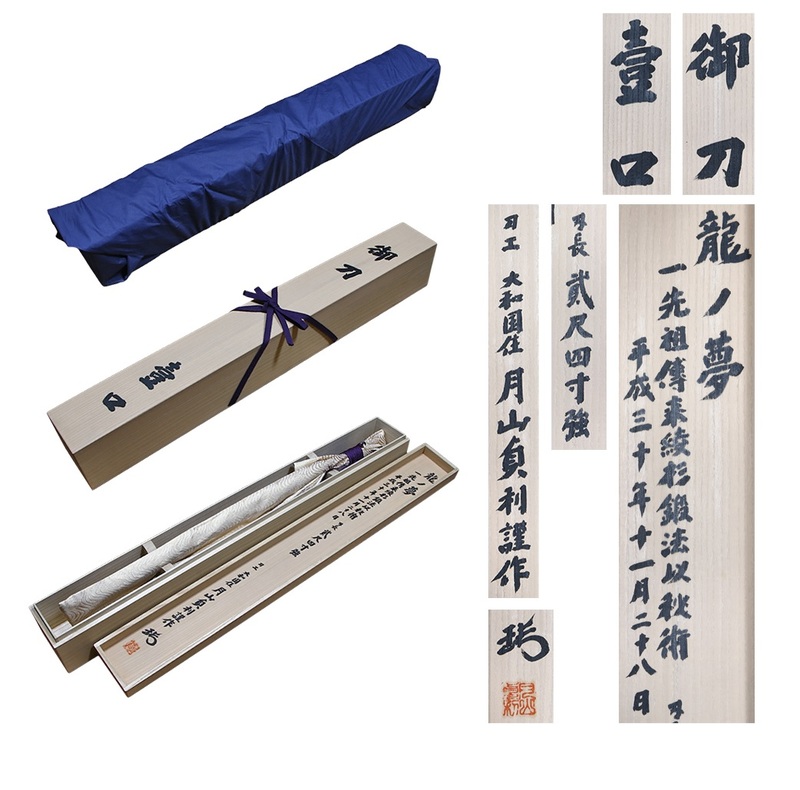 There is a Juyo Bijutsuhin with a weaker signature, and suriage (mei right at the bottom), and then the Shimazu one mentioned which is suriage. There is one Juyo Bunkazai that is ubu and owned by the Mishima Taisha. So that one is not leaving Japan nor will enter a collection. So this is the sixth known example and has the best nakago of them all including the Jubun one as that one is not kijimomo. This is going to await NBTHK confirmation still. 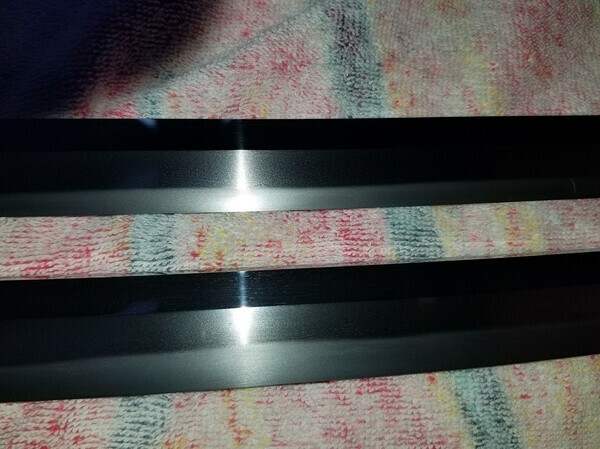 Info on the other blades is from me not Tanobe sensei. He went over all the existing signatures and said this one has the proper common elements and is in his opinion authentic. Polisher has been suggested and agreed to and the owner is going to move it forward and see what happens. It can't get fixed up in time for the upcoming Juyo shinsa so it won't be in there but if it polishes OK I think Juyo is basic and then I think should be a strong contender at Tokubetsu Juyo. Still some ifs based on polish results. 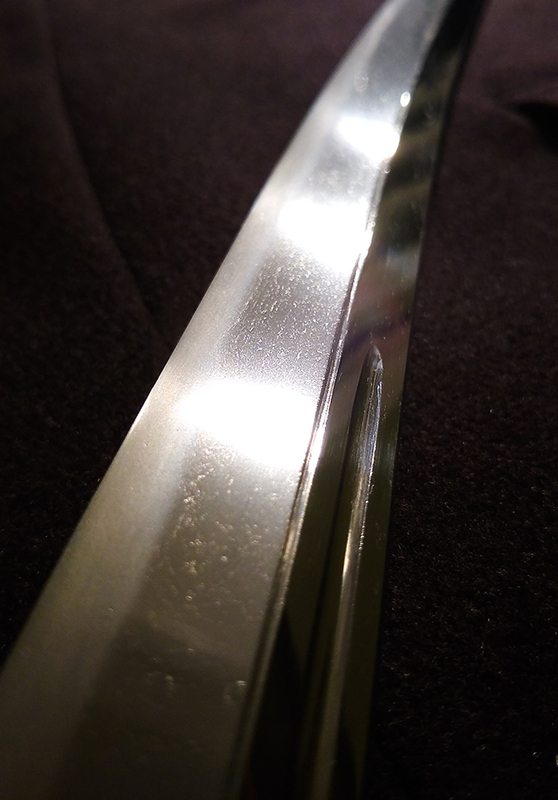 A while back, I purchased a tanto with horimono by Kasama Ikkansai Shigetsugu. The tanto came with Tokubetsu Hozon koshirae. It didn’t have papers, so I figured while it was there, I’d send it through shinsa. And since I was submitting, I may as well do dual TH and Hozon submission (a practice for Gendaito that I’ve been told is a foolish waste of money, as TH is VERY seldom awarded to gendaito). Well, news came back that the sword passed TH! 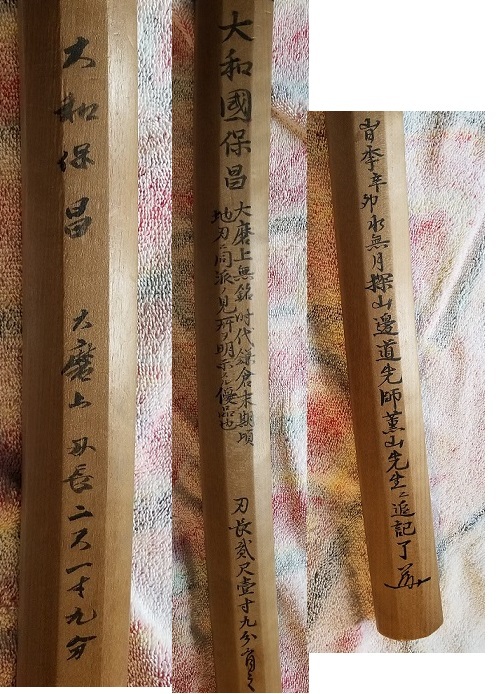 Here is some info on the sword and a pic of the blade and koshirae. Blade length : 25.0 cm or 9.84 inches. Width at the hamachi : 2.66cm or 1.04 inches. Kasane : 0.54cm or 0.21 inches. Era : Showa 12 year (1937). 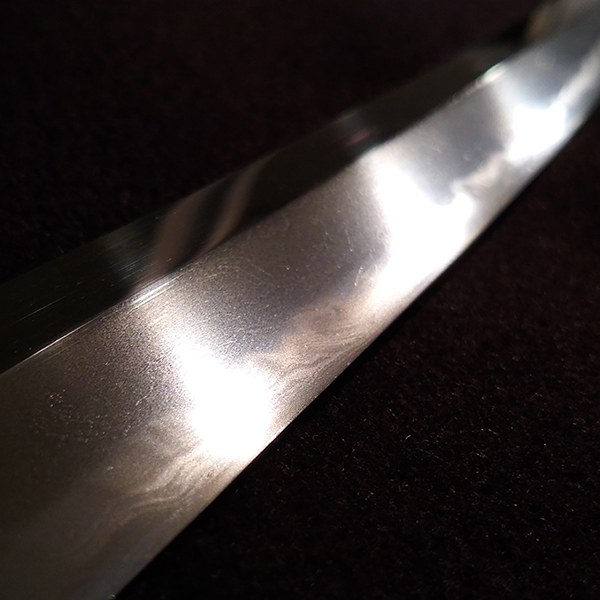 Shape : The blade is rather wide and thick with Horimono. and Kenmakiryu on the reverse side. and visible to see the texture well. Hamon :Niedeki rather deep nioikuchi Choji midare. Otherwise, PM me and I'll send it to interested collectors via email. 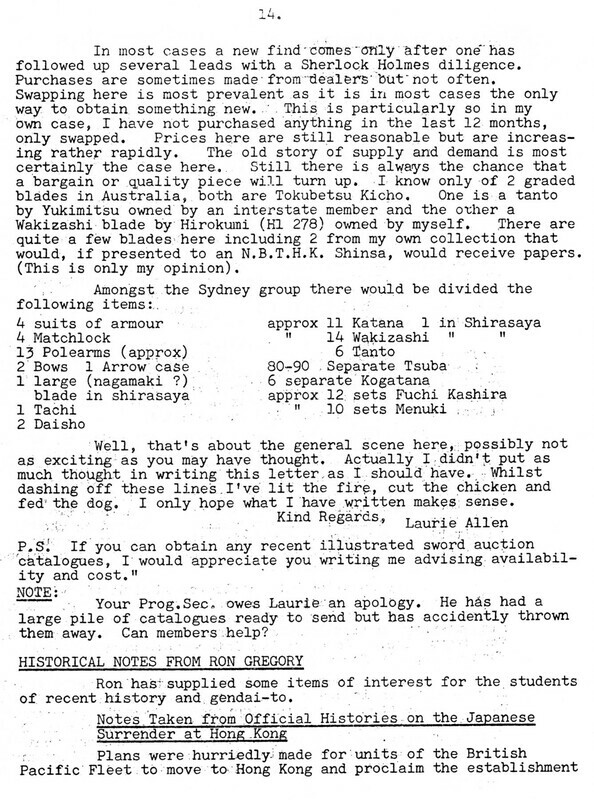 Another interesting thread, one where my position since its initial airing in the 1972 Dallas show and NBTHK shinsa, was made fairly clear through my essay published then, with the title "On Investing in Japanese Swords" in The Book of the Sword. The argument was laid out in fairly straight forward Econ. 101 terms that one should never expect to make an "investment" return on such storable tangibles as Japanese swords, which offer neither a monetary dividend or interest, in comparison with financial assets of the same risk (!). The argument was general and over a large population, and individual exceptions would be exceptions which might weaken the thesis, but not destroy it. The position was theoretical and not empirical, and the latter still generally awaits in the field of all arts. Anyway, since then what has impressed me is how much more "perfect," in the economic sense, the Japanese sword market has become. Many factors have contributed to that and the two biggest forces have probably been the widespread translation of some of the goldmine of Japanese language knowledge into Western languages, by facilitators like Harry Watson and Markus Sesko, but others as well, who can claim a real and lasting impact through their skills. The second dramatic change over time has been the internet. The impact of those events have come close, only close, to wiping out the huge market advantage once held by folks "in the know," a tiny percentage who knew price differentials East and West, sources of supply, who the deep pocket buyers were, etc., etc. These days the price for a narrowly defined representative sword, representing almost any period, school, smith level, etc., is virtually the same anywhere in the world net of taxes and transportation costs including "red tape." If a sword is bought today, given all the information out there and a reasonable bargaining skill balance between seller and buyer, it is likely that the price will be closer to a realistic market price than ever before. If the buyer thinks of the acquisition as something to profit from, that likelihood would be quite dependent of the time lag after purchase. To expect to buy for x dollars today and sell, for example x plus 10 % in the very near future would seem unrealistic to me, given the increasingly equal knowledge held by most prospective buyers. With the passage of time, which would allow primarily for changing tastes, that sword bought for x dollars might appreciate or depreciate in the view of prospective buyers and thus generate a gain, but perhaps a loss with equal likelihood. Once a substantial length of time between buying and selling one's "investment" has occurred it should be no surprise that the nominal selling price the owner gets might generally be expected to be higher than what he initially paid ,and that of course would be on account of the destruction of purchasing power of the dollar - we are abstracting from currency valuation issues of course - brought about by inflation. The seller might easily have sold for a higher nominal price with the same purchasing power value of cost of the item five or ten years earlier. Economists call that the money illusion and it is an endless slight of hand that makes us think we are better off when we are not. I think that as collectors we get a sort of psychic income from the pleasure of ownership and that is the compensation for a lower expected dollar return on a storable tangible like a Japanese sword in comparison with a higher dollar return demanded by the owner of a financial asset yielding a dividend or interest payment. Midas might differ on that view, but for most of us enjoying the beauty of a wonderful sword just has to trump counting up one's shares held by some brokerage. To digress on just one more point, I am not at all sure that the collecting community is shrinking. 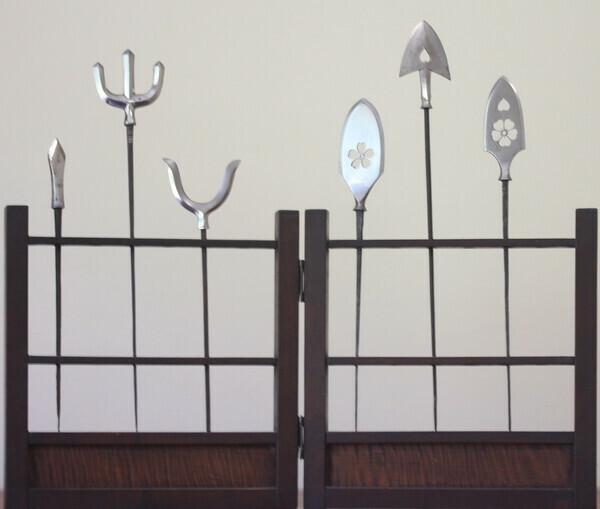 I think we should be optimistic about an interest in Japanese swords spreading to cultures and countries well beyond the usual site of Western buyers in North America and Europe, and further in our new electronic world physical presence in a person to person group is less pressing than it was decades ago. Finally it seems to me, perhaps Brian can confirm this, that new folks are posting here all the time with questions, seeking information and expressing their own interest in the Japanese sword and things that go with it. I feel strongly that while those folks might not stick around or become collectors, and most have a knowledge deficit position at the moment, they ought to be welcomed and treated with courtesy to the best of our collective ability. Laurie Allen died on Thursday 15th December 2016 at 76 years of age in Sydney, Australia. 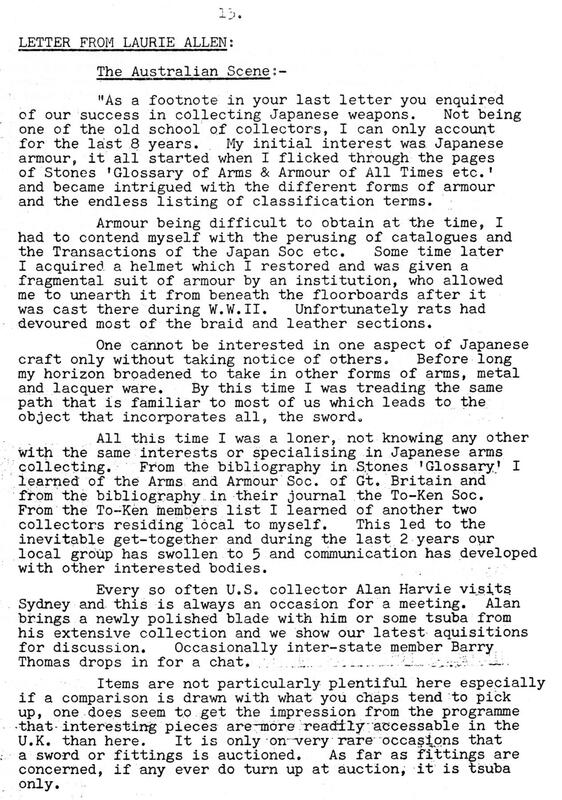 Laurie was a devoted student and collector of Japanese Arms and Armour. 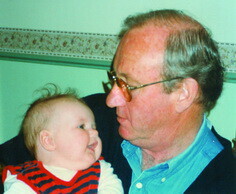 He was known to many around the world by correspondence, but not on NMB because he was only, in his old age, just coming into the world of the computer and internet helped by one of his savvy grandsons. I did my best to keep him up to date with arrowhead happenings on NMB. 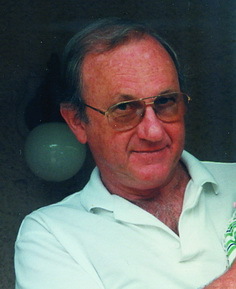 Laurie was a widely liked and respected collector in Australia for his great knowledge and friendly and generous manner. At a gathering he could be relied upon to come up with a pearl of wisdom unknown to others. He was a great general conversationalist with a great sense of humour as well and our meetings were liberally lubricated with beer, wine and good food. For all these and more reasons I did not want to see him slip into obscurity, so here I am to shine a light on our dear mate and share his accomplishments with you all. The photo below left shows his ready smile, the Laurie we all remember, and the other his obvious pride in being a grandparent. The photo below shows Laurie late last year, enjoying himself at an art show with a beer in his hand. Laurie started collecting around 1964 and I got in contact with him shortly after, even though we lived some 650 miles apart. We have been firm friends for just over 50 years, visiting each other through the years and meeting with other collectors in our home bases. I’ll let him tell his own story as it was in December 1972 - see attachments from the To-ken Society of Great Britain “Programme”. Over the years Laurie had many good pieces of tosogu and Nihontô, numbers of which were sold as business exigencies arose. I was fortunate to be able to acquire some of these and in turn pass them on as my own finances became stressed! 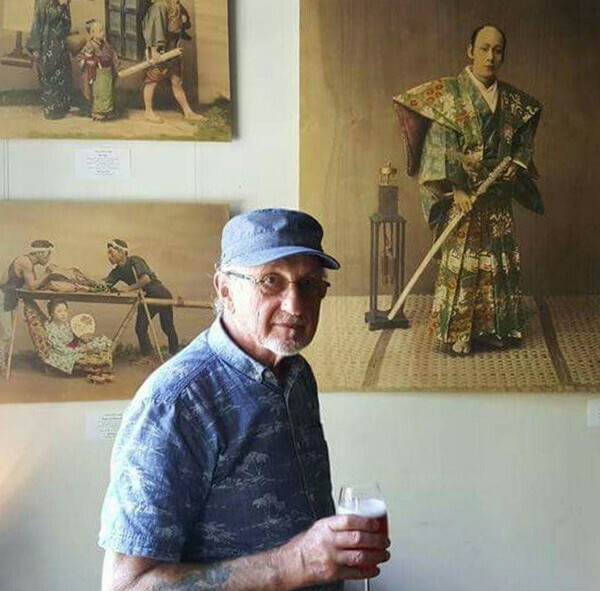 The time came when nearly everything was sold and Laurie offered me a karimata yanone by the Shinshintô Satsuma sword smith MOTOYASU, MOTOHIRA’s brother. I was enjoying this piece when Laurie asked if I would send it back to him as he had decided to collect yanone. That was the beginning of an odyssey that occupied Laurie for the next 30 years or more. At its peak his collection comprised around 300 yanone, while at his untimely death he had some 40 yanone. Sadly, as was always the case, better pieces had been sold to keep his business afloat. A great concern of Laurie’s was the poor condition of many of the arrowheads he encountered. He approached a polisher in Japan who polished an arrowhead Laurie had in the form of a miniature magari yari, but declined to do any more. From his knowledge and experience Laurie understood there were no shortcuts when it came to polish. However, to “see” his arrowheads better he devised his own techniques through his understanding of sword polishing. He was rewarded with success when hada, hamon and yakiba could be clearly seen. A visiting professional polisher from Japan on seeing Laurie’s work expressed surprise and complimented Laurie on his achievement. The picture below shows one of his successes among many. 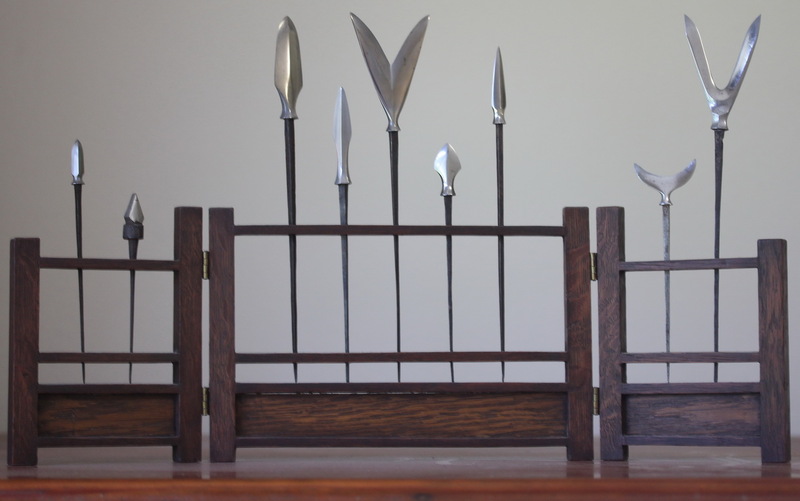 Unable to buy traditional racks to display his arrowheads, Laurie designed one and had a retired cabinet maker turn them out. Thus in his last years Laurie could sit in his lounge room watching television and seeing three racks of arrowheads on his entertainment unit. Here are photos of those. He also had the retired cabinet maker turn out custom boxes in Japanese oak for his better arrowheads - there were a lot of boxes!!! Laurie had other strings to his bow... He developed an interest in kabura-ya, Whistling Arrowheads. From research and drawings he made a few of these and fitted them to shafts. He also had a strong interest in Sôhei, the Warrior Monks of Old Japan, and undertook research into their history. His remaining passion that I can recall was the Mongol invasions of Japan. On one trip to Japan he made a point of visiting Hakata Bay just to behold the wall the Samurai built to forestall the Second Invasion of 1281. A favourite possession was a diptych of one of the invasions with Samurai fighting the Mongol warriors. Our good mate Laurie is sadly missed by all. A bright note is that his entire collection was bought from his family by a good and worthy friend in collecting. Going to be listing this soon. I thought it makes for a good idea of how brutal some of these Nanbokucho swords were in comparison to the period beforehand. This is attributed to Hasebe, and the comparison sword is a Juyo Token Rai Kunitoshi. 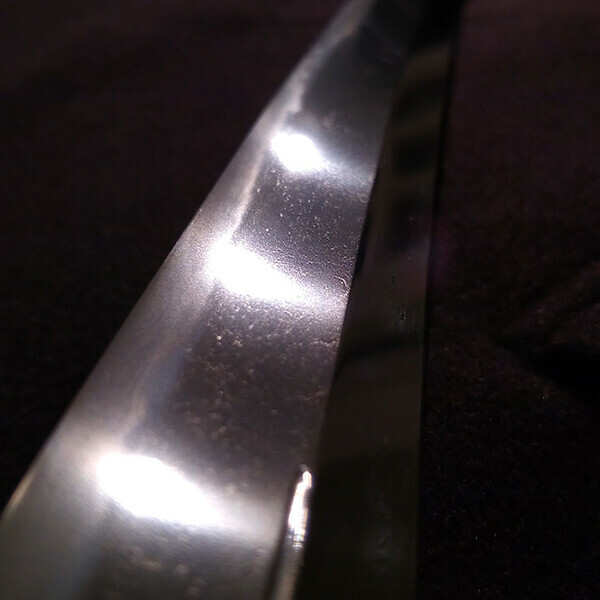 It's wider at the yokote (3.2cm) than most swords are at the machi. Kissaki is just shy of 8cm. I had the pleasure of working with Osaka TV today. The crew has flown to the UK to make a short program about the English Katchushi who makes his own odoshi and works for Japanese dealers. There was a lot to film and we covered the difference between sengoku and edo period armours, also the changes that took place in manufacturing after the teppo was introduced to the battlefield. We spent some time filming the process of making odoshi-ito and then a section on armour making and urushi. I managed to get the message across that there is an obligation for a katchushi to restorer armour to the best of his/her ability and that such work preserves katchu for future generations. A sense of giri which is extended to the former samurai owners. I felt this was an eye opener for the Japanese when they saw 30 armours they freaked out. We are certainly letting them know that there is a lot going on in the west. I was naughty and put some katchu "easter eggs" in should you be able to spot them. 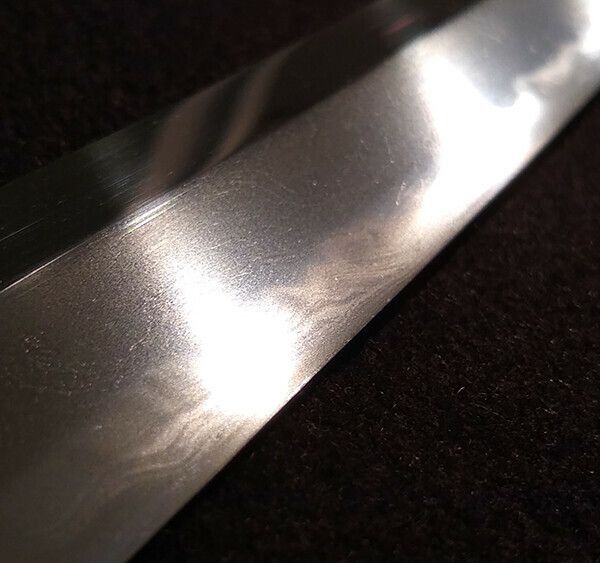 Using acid for polishing Japanese sword is not good for preservation as we know. You can not really see it (especially with good polish) but, it will damage the steel in a long term. But, In fact, it is very popular today. we can find a lot of discussion about modern polishing techniques in Japanese article and forum sites. some are very hard discussion (include some of master polisher's names...). some said the acid and machine polish is the main stream in modern polish. it is not only cheap polish, high ranking (or mukansa) polishers are also doing it. We can see some Japanese polisher complains on "Facebook Time line" page or own website about (acid) rust/polish. Our polishing workshop also often receive such blades as well. They looks like normal rust, but the rust (mainly dot shape) by acid is very deep that could not polish off. sometime we had to return without polish. The history of Acid polish (modern sashikomi?) was established in WW2 time. They were doing Kanahada nugui to make Ji dark and use acid to make Ha white. that is why we used to call such polish "Gunto-togi". mr.Eto is still calling them "Gunto-togi". He is saying that many swords will not survive next 100 years. in middle of 1980', Mr.Eto was requested sending a polisher to France. He sent one of his student and he lived in Paris for 3-4 years. When he start to live and polishing swords in France, he told his master Mr.Eto that the most of clients were ordering acid (Gunto) polish. Mr.Eto told him not to do it. but, If he doesn't do it, he has no job, so he was doing it. When people in the west start to see and collect Japanese swords was after WW2 and 60'. 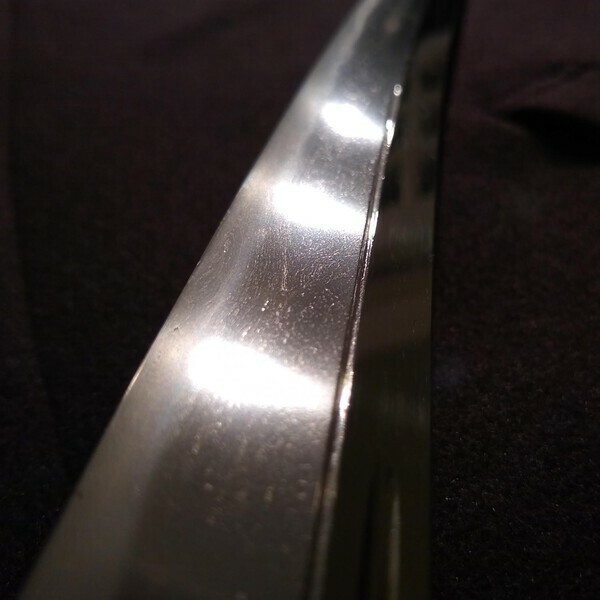 so, those polishing style became kind of standard of Japanese sword polishing said mr.Eto. When I came to the Netherlands and jointed NL Tokenkai in 1995. I saw many acid polished blades in their collection. 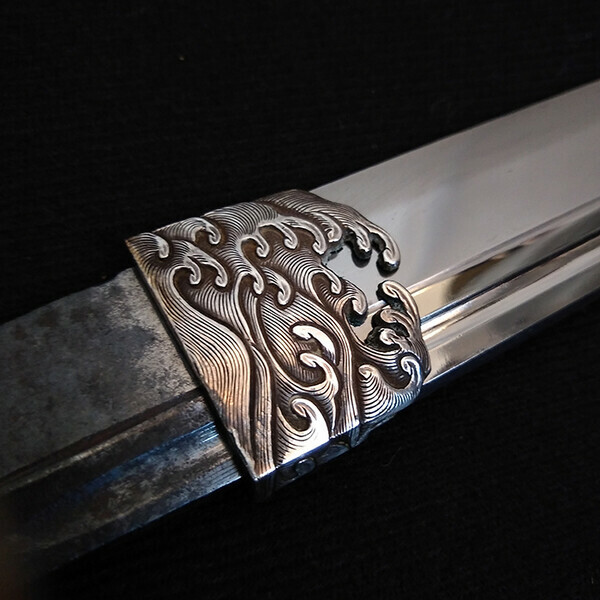 I understand why it is so popular, because, you can see clearly activities of Hamon and damascus style of Ji-hada that make looks wild and fancy. but, those are not what we should see. you will miss real actives and beauty of old steel. Modern Polish with Kanahada-nugui and Hadori polish is called "Kesho-togi" after Hon-ami Ringa established in Meiji period. so, I tried to explain the fact, but, he didn't want to listen or think about it. Every time I try to tell him, he keep changing subject or run away from the conversation. and he sent me a copy of some book of Japanese sword polishing. "Because it wont state they use acid in the book"
"I am curious about the polishing process but i have nothing to win or lose regardless of what methods the polishers use. That was the last word I hear from him. Mr.Eto told me that it doesn't help if I try to tell people. Many swords won't survive next 100 years. 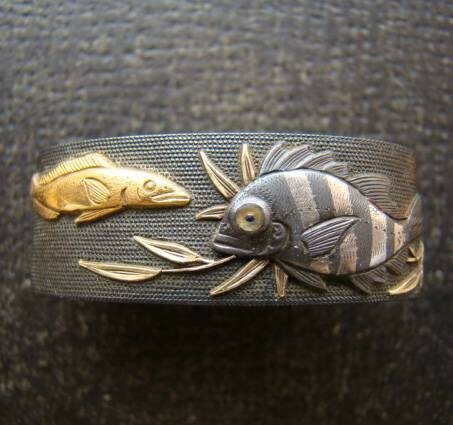 When the level of collector's eyes/demand goes down, the quality of craftsman's work also goes down. If the owner of the sword wish high quality work and if he has eyes, the craftsman must work with his level, unless he doesn't get a job. Judging/choosing by own liking without knowledge and understanding or just following market principle are very dangerous. This kind of mentality will destroy Japanese sword in the future. Putting tomato ketchup on Italian dishes or mayonnaise in sushi and say "Because I like it" is fine. but, acid on sword is not okay. I can not explain too much details on public, because it might harm someone's business, but, I am trying to explain to our clients with private mail. The sword has long life but it is only with proper care by people. People probably want to hear some news ... I have the blade in Tokyo now and I am 100% sure that this is a late Heian / early Kamakura blade. The curve is great the nakago is perfect. I showed the blade at a dealer today and a Japanese collector was in there as well, when the nakago came out of the tsuka it got a couple of gasps because of the kijimomo shape. Japanese collector in particular smiled at me and remarked on it. The hamon is hard to make out in the current state but it's there. The shape is everything it should be and there is only one ubu blade by this smith and that blade is Juyo Bunkazai. 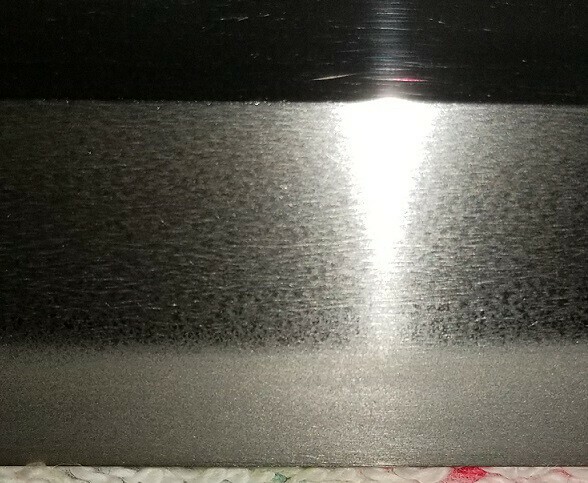 The problem is that it is a bit thin now and polish will have to deal with the defects caused by rusting. I think the mei is legitimate and I don't see any reason to doubt it offhand. What's more the saya and tsuka are Tensho koshirae (Muromachi period) and worth fixing up and preserving. 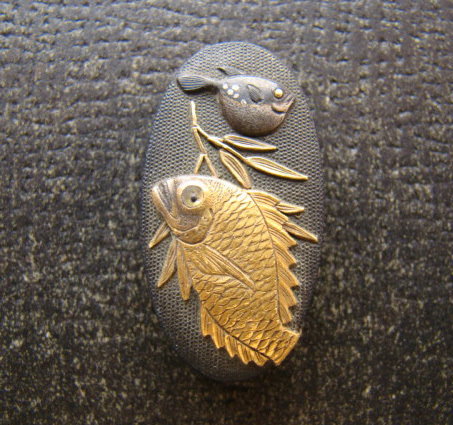 The menuki were lost and the fuchigashira were replaced in the Edo period and appear to be Yoshioka school and high quality. 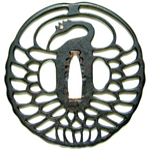 The tsuba is not high quality and my theory is that this blade was rushed into service, it had a nicer tsuba which was set aside when the owner went to war and a serviceable one put in place. Not enough time to redo the tsuka lead to the good one being used. Probably when it was taken back the menuki were removed and used as ornaments or cufflinks at some point, as they were probably something like goto shishi. I will show the blade to Tanobe sensei tomorrow. Since there is only one ubu blade by Ko-Ichimonji Munetada if this is confirmed it is a major discovery. It is just hope if it will polish out OK, about 40% of the hamon is visible and because of the rust defects it's a bit hard to know where there is choji and where it is wishful thinking. As Ko-Ichimonji it should be a ko-choji based hamon so will see more soon. It's nice to be involved and the board should be too, especially hats off to the owner for submitting it and Michael pounding the table, as the blade appears to be an important treasure. Even if it polishes out weak, you cannot take away an ubu early Kamakura nakago. 1. There is a nice utilitarian aspect of the fact that it lets you know what's inside if you have a good number of blades. 2. I think the calligraphy is beautiful and it looks very nice on display. If you're lucky enough to have koshirae and can put them on a stand side by side it's very complimentary. 3. 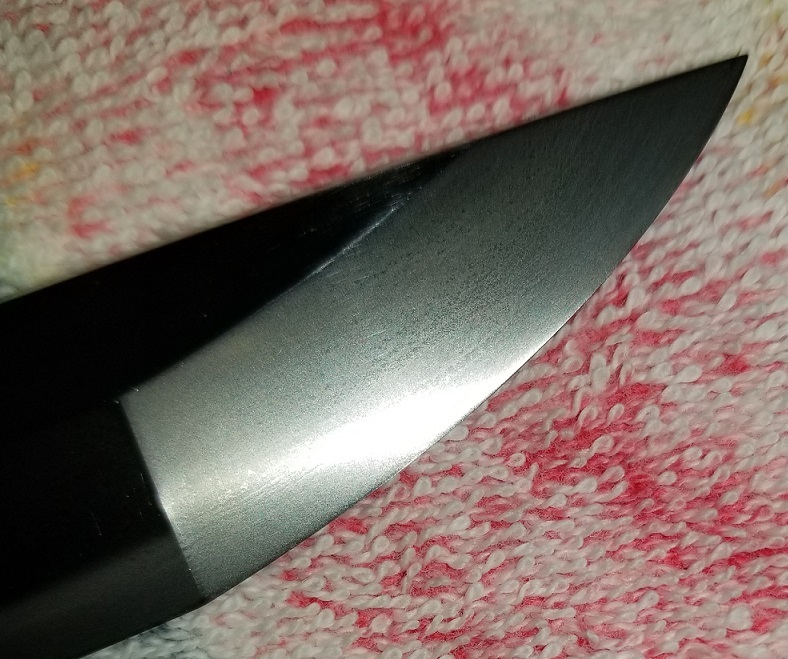 It's nice to have the thoughts and comments of Tanobe sensei on the blade as an independent observation and confirmation of what's inside over and above the papers. 4. People do lose the papers. It's hard to lose a sayagaki. So it's kind of a backup plan for the sword if you're in it for the long haul, get hit by a bus, and your heirs end up with your swords and no descriptions of anything were left for them. 5. It's another judgment and some people can and do disagree with a paper from time to time, so if you have multiple judgments it does help to slam dunk the answer. "Chin-chin cho-cho" is an ongoing topic. The history on this is that some people started noticing a correspondence between this phrase and Juyo blades and started thinking it was a code. People always want to think there are short cuts. It started going around that this meant that it was somehow above Juyo. Bob Benson talked to him about this and I talked to him in person about it some years ago. The "if your house is on fire, this is the thing you should grab before you leave" is indeed something he has said about chin-chin cho-cho. But he will say this is what Juyo means as well. He also says he likes to mix things up so if he doesn't say chin-chin cho-cho, it doesn't necessarily mean that the blade is inferior to one that does have it (though it could be). He will use various phrases or indicate through the commentary that the blade is special without referring to a stock phrase. I think that chin-chin cho-cho mostly comes into play when he thinks that the blade is a good Juyo, he's not sure what else to say other than to just state that it's very special, and it also helps him balance out the two columns of commentary with just the right amount of space used. He also has a particular taste in blades... he likes very much very dignified koto blades. So his tastes will run to Heian and Kamakura Yamashiro, Aoe, Ko-Bizen and Bizen Nagamitsu, Sanenaga, Kagemitsu... blades that are very noble. More flamboyant works I feel are not to his taste, he will prefer I think Yukimitsu working in Shintogo style to Yukimitsu in Masamune style. This is not so much from what he has said to me as what he has shown me that he is working on that are discoveries and how he has responded to blades that I've had in for sayagaki and shown him. He also likes Shinto Satsuma. But anyway back to chin-chin cho-cho, it needs to be understood as a rule of inclusion. If it's not there it doesn't mean anything necessarily but if it is there it means he is praising the blade. Chin-cho may be there and from what I can understand it's not necessarily different from chin-chin cho-cho though it's not doubled up. What I settled on after all the years was trying to understand the context of his comments. 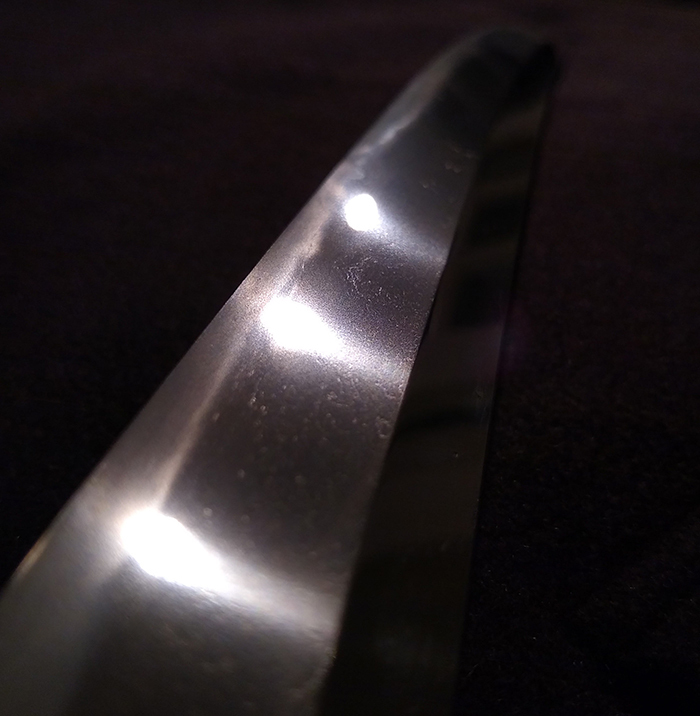 When I had a strong feeling that the blade was outstanding at Tokubetsu Hozon or Juyo and felt like it could go to Tokubetsu Juyo, and have brought him the blade it has come back with very long commentary and detail. In a couple of rare instances, he has run out of room on a full length blade and has gone to the other side of the saya. This has no chin-chin cho-cho or anything like that in it. But the effort and detail show his state of mind when viewing the blade. On one of these he took pains to compare the blade to a specific Tokubetsu Juyo blade. If he is doing that, the effort and detail of thoughts I felt was a lot stronger than tossing in a chin-chin cho-cho at the end. In comparison, a "commercial" level Shinto work that was a decent blade but nothing special, just won't have the detail because he really doesn't have anything to say on it other than that it's authentic. If you send in a standard blade you're going to get back a standard statement that the blade is authentic, signed and comes from a certain period, and nothing more. Here are examples of his commentary and I think that it's good for understanding the subtext. This blade was once a signed naginata of this smith which was shortened in the Muromachi period by Osafune Sukesada who added this information via a kiritsuke-mei. Kunimune worked in a flamboyant choji-based hamon, and in a gentle suguha-based hamon mixed with some Aoe characteristics. This blade belongs to the latter category and matches very well a tachi of Kunimune which passed Tokubetsu Juyo at the tenth shinsa. The deki is excellent and the work is very tasteful. It is shortened and unsigned. The period is Nanbokucho. The blade has an o-suriage nakago but which bears a kinpun-mei attribution to this smith by Hon’ami Tenrai. Tenrai was an expert from the Mito branch of the Hon’ami family who was active from the Meiji to the Showa era. The blade shows a suguha-cho that is mixed with saka-choji and saka-ashi and layers of linear utsuri can be seen as well as a jifu-utsuri. In combination with the sugata, we do not only recognize the characterstic features of the Aoe school from the end of the Kamakura period but can agree that the attribution of this masterwork to Yoshitsugu is spot on. The blade is o-suriage and unsigned but the jiba shows the characteristic features of Rai Kunimitsu and the deki is highly dignified. Chin-chin cho-cho. Although shortened and unsigned, this is judged an excellent work of Norishige. The jihada and hamon clearly show his characteristics. Chin-chin cho-cho. The last two are typical chin-chin cho-cho examples. He has not gone on at length but the smiths and the work are excellent and Juyo and he has rounded them out with chin-chin cho-cho for highest praise and left it at that. But the examples in 1. and 3. though lacking chin-chin cho-cho are clearly not inferior when read. The detail and effort made are consistent with the blades being very important. Example number 3 is only Tokubetsu Hozon but I think it will easily pass Juyo and potentially go higher. Example number two is something that if you get one of these you know that you don't have to submit it to Juyo. Another example might be where he will say something like: The nakago is ubu and bears a seven character signature. The period is later Edo and this is the work of the second generation. I think in these cases when he veers more into subjectivity of any sort, whether that is a lot of effort or by putting in the standard praise words, it's because he likes the blade a lot. When he chooses not to offer the subjectivity then by omission you can classify where the blade stands. This is why I say chin-chin cho-cho is a rule of inclusion: there are multiple ways of getting to that point, so if it's not there, it doesn't mean that the blade is at a lower level than one he's said it on. When you're completely lacking anything with subjectivity and it's just a short recitation of the facts, then this is something that is equivalent to Tokubetsu Hozon with no chance of going any higher. It's a worthy blade or else he wouldn't do sayagaki at all. So the fact that he has put a sayagaki on it means that the blade is above Hozon qualifications. It used to be that you needed to have Tokubetsu Hozon to come to him and ask (not sure how that got established but that's what I was told, when he was an employee of the NBTHK he didn't want to be a separate independent judge). Now that he's retired he will make his own judgment without it being papered. If he's gone off the beaten path somehow with his comments, then my impression is that the blade is equivalent to Juyo. If he has gone excessively off the beaten path then you have got something very special. The blade is dated Bunna two and signed and is thus the only signed authentic tachi of Hiromitsu I know, although there are many signed tanto and ko-wakizashi extant. Thus it is a extremely precious reference piece and also very precious because it shows us that Hiromitsu bore the honorary title Saemon no Jo. The blade has a very dignified sugata and a perfectly healthy jiba and must so be regarded as one of the greatest masterworks of this smith. It was once a heirloom of the Echizen-Matsudaira family, is published in the Imamura-oshigata, and was once designated as Juyo Bijutsuhin. So, we know the level of this blade is clearly one of the most important blades in the world. There is no chin-chin cho-cho or anything like that, but the pattern is the same as the first and third examples above. 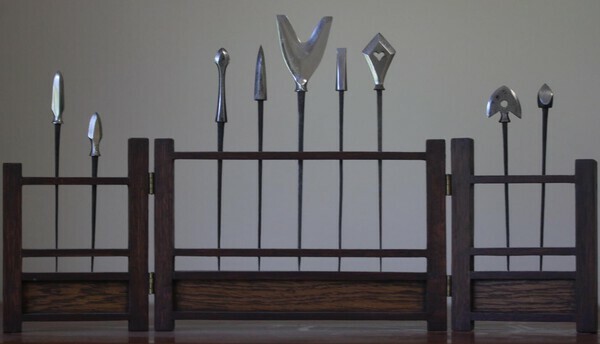 He has gone into detailed commentary and for me, I think that this then is the template for the kind of thing that has affected him on a personal level as someone who loves swords and not just as a judge authenticating a piece. It's my opinion then that if anything is to be taken as a short-hand "code", it's to simply example the work that he's done and make a call about how much effort has gone into it. Chin-chin cho-cho is just a way for him to say that the work is really outstanding but he hasn't been triggered to go into one of these long commentaries. Maybe it is just really typical and so typical that there is nothing other to say than "it's really really great!". Intellectually I think it is probably equivalent but my gut feeling though is that the examples of long commentary shows his emotions better than the praise words because the praise words, though they mean something very significant, are standard and the full context is inspired. Additional thoughts are that he will sometimes have a data nugget to throw in that you cannot find anywhere else. I found out that the Nidai Hasebe Kunishige's personal name is Rokurozaemon and I cannot find that piece of information anywhere else. Or, if the NBTHK could only settle on something like "Ichimonji" then he may clarify and do his sayagaki to Fukuoka Ichimonji. There is an ebb and flow with the NBTHK judgments that change as the judges change over the almost 60 years of Juyo... where some they may be happy to be very specific and in other times you can see they took a turn for the conservative and it changes like the tides. Some commentaries, like recently, they go into a fair amount of depth but half of it is cut and paste boilerplate for the background of the smith and school... it's still a lot better than a lot of the late 60s early 70s stuff where they in some cases put just one or two sentences into the commentary. Just depending then on the year something went through, you could get radically different approaches to what is an effective commentary and judgment from the NBTHK. They will not be varying in terms of the ultimate goal, which is to give a judgment that they stand by, but they will be of different utility as a learning tool because when they go terse and conservative they don't really throw you much of a piece of meat to sink your teeth into. So this is another nice thing to get for sayagaki because ultimately he is a scholar and a teacher and you are receiving his opinion. If the NBTHK could only settle on a vague statement: Awataguchi or Ko-Kyo or Ichimonji or Hasebe, and he has clarified that to Kuniyoshi or Gojo Kuninaga, or Fukuoka Ichimonji or Hasebe Kunishige, this is useful for us as a learning tool. It's a judgment, his judgment and it is worth whatever you respect him for. And you never know what you're going to get out of the process, you just ask if he will do it, he will inspect the blade and then let you know if it's possible. And if it's possible you thank him and wait to see what he's going to write. If you're lucky he will confirm what your feelings are on the blade somehow. If you're not, he won't and then probably you will have some head scratching and study to understand why (or maybe you will never understand). Or maybe you will find out that he liked it a lot more than you thought he would. So in conclusion you just want to remember that you should really get these things translated and so to understand his thoughts and how he arrived at the sayagaki. It isn't reasonable to expect him to do a Hiromitsu style sayagaki like on Bell's on your every day Tokubetsu Hozon shinto piece. If he offers anything subjective at all on a shinto piece then that is really good for a shinto piece. You need to put that in context that he has seen 10 quintillion equivalent polished Jo-saku shinto swords in his life and he is not going to leap out of his chair for the next one. That's what makes these long sayagaki something special then or even chin-chin cho-cho, because he's singled it out after seeing so many and it should give some context to the blade. Because in some of these cases the blade is really unique. In Nihonto, things go really, really slow. Until they go very fast. When I started really going into this study I favored Ishido school swords (still love them) and some other works. I saw my first masame sword right here on NMB, and I was lost to the art. Something just speaks to me about the flow and structure. Who can really explain their own desires? It is what it is for me. I posted here late last year about looking for another masame sword, thanks to all that reached out. I was fully prepared for another year long search and waiting period. But, what if the very sword that I saw here on NMB was a possibility? Longer story short, I was able to work with Jean (with help from a couple of friends) and arrange for myself to become the next care taker for this sword. It's an honor. I won't re-tell the whole story on this sword, though it's an amazing one. 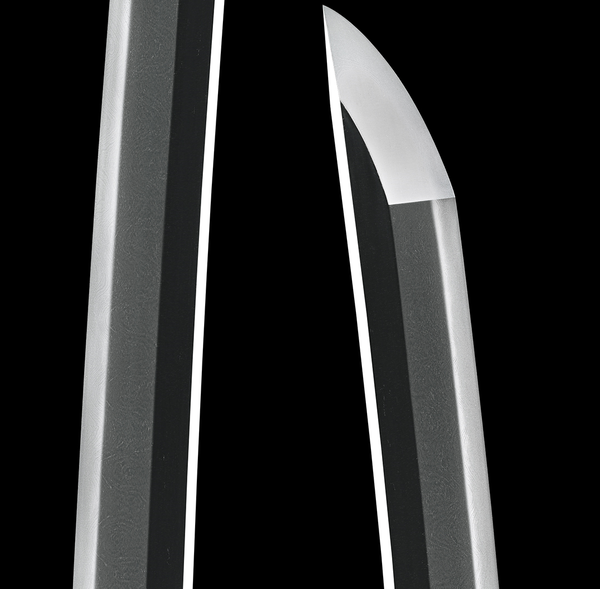 The sword also came with a Tensho koshirae that is so menacing looking, it almost looks like it wants to get into a fight. So well done. I welcome the newest addition to my Nihonto family, a Yamato Hosho/Tegai Kanekiyo masame work. Please review Jean's older thread about the sword, it's interesting and a good education on attributions. Greatly shortened and unsigned, dates to the end of the Kamakura period. This is a masterwork whose ji and the ha show the characteristic features of this school. The sword was submitted to NBTHK Shinsa and came back as Tegai Kanekiyo. Early Tegai works showed excellent masame so it's not a huge jump from Hosho. In hand I can't explain (and can't photograph for crap, as I learned tonight.....) the vivid masame that flows through the sword. Held from nakago and in correct light angle, it runs and flows along the blade. At the kissaki, the lines of the masame condense and turn up to tip of the kissaki. As this sword is suriage, cannot see if masame turned down at hamachi. The nie deposition is heavy. Sungashi abound in hamon, long kissaki, I could go on. Headed to Japan for January NBTHK shinsa.